Former British PM Margaret Thatcher will be given a ceremonial funeral with full military honors at St. Paul’s Cathedral in London. 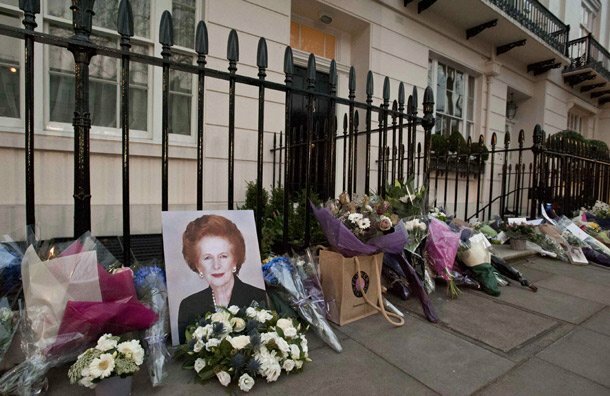 Margaret Thatcher’s funeral service is expected to take place next week, and will be similar in status to those accorded to the Queen Mother and Princess Diana. Many members of Parliament have called for Iron Lady to be given a state funeral, as was given to former Prime Minister Winston Churchill, but that was against her own wishes. Margaret Thatcher’s spokesman and friend, Lord Bell, has said that Britain’s first female PM “specially did not want state funeral, and nor did her family”. “She particularly did not wish to lie in state as she thought that was not appropriate,” Lord Bell said. Details of the ceremonial funeral with military honors are understood to have been mapped out in talks between government officials and Baroness Thatcher more than five years ago. Former Soviet leader Mikhail Gorbachev and Nancy Reagan, wife of her closest ally US President Ronald Reagan, are expected to lead a list of international mourners. Margaret Thatcher did request a central role for The Chelsea Pensioners at her funeral. The Army veterans will not only welcome her coffin when it arrives at St Paul’s, but will also benefit from donations made in her memory – her family have requested that, instead of flowers. The day before the funeral takes place, Margaret Thatcher’s coffin will be moved to the chapel of St Mary Undercroft in the Palace of Westminster. There will be a short service following its arrival and the coffin will rest there overnight. The following day, the streets will be cleared before the coffin travels by hearse to the Church of St Clement Danes, the central church for the RAF, on the Strand. There it will be transferred to a gun carriage drawn by horses of the King’s Troop of the Royal Artillery, the Queen’s ceremonial Saluting Battery. Lady Thatcher’s funeral cortege will pass through Whitehall, Trafalgar Square and along the Strand, round Aldwych and then up Ludgate Hill to St Paul’s. Serving members of all three Armed Forces will line the route, alongside an expected crowd of tens of thousands of people. At the steps of St Paul’s, the coffin will be met by another Guard of Honour and the Chelsea Pensioners. Members of the three services will then bear the coffin into St Paul’s for the funeral service. As well as friends and family of Margaret Thatcher, politicians who served in her cabinet are expected to attend the service alongside current cabinet members. It is not yet known whether the Queen will be attending. After the service, there will be a private cremation service in Mortlake, south-west London. It is understood that Margaret Thatcher wished to be laid to rest alongside her husband, Denis, who died in 2003, in the cemetery of the Royal Hospital Chelsea. Will Margaret Thatcher's funeral be attended by the Queen?